For four generations, over six decades, a member of the Sandler family of the Massachusetts South Shore has been to nearly every Patriots home game. This family's dedication is hard to match - someone named Sandler has been to every Patriots game at Gillette Stadium, and most other home games, for six decades. For four generations, the Sandler family of the Massachusetts South Shore has been as committed to the Patriots as any family in New England. "It's in our blood. My grandfather Joe Sandler, we call him Papa Joe, he had season tickets when the team started in 1960, I think it was, at Harvard Stadium, Fenway Park," Bryan Sandler said. Four-year-old Noah Sandler and his 2-year-old sister, Ella, make up part of Generation Four. When asked who was on her shirt, she replied, "Nonk." Part of Generation Three is their father, Bryan Sandler, who was born into season tickets, along with his younger brothers, whose first memories are being around the team. "I think I went to my first game when I was 3," he said. "They used to bring a milk crate in. I could sit on the milk crate so I could see over the wall." Bryan Sandler has been to four Super Bowls. His dad and brothers went to the ones he missed. His parents even moved to Foxboro to be right near the stadium. "Yeah, more or less. He was looking to move anyway. He had season tickets, so he decided, what better place than Foxboro?" Bryan said. Now, nine years after Papa Joe passed away, for each game, there's a special way to remember him and his love of the Patriots. "Every day we go into the stadium, season ticket holders - you can get a little plaque with your name on the seat. So we put his name on one of the seats. We all go in, we give it a nice tap," Bryan Sandler said, pointing to the sky. 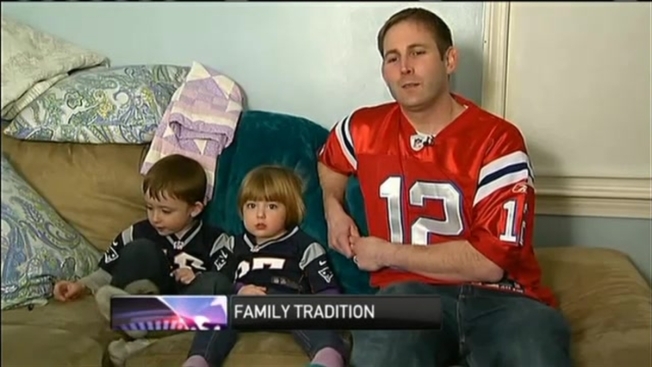 He is passing on that tradition to his kids, as the Pats take on the Colts, the next step toward Super Bowl XLIX. "Stranger things have happened, but feel pretty good," he said. The Sandler family will be in their seats at Gillette and are looking forward to the AFC Championship on Sunday night.